Which Vitamins Help Support Energy? From liquid energy “shots” to grande lattes, Americans love a good energy boost. But if you feel chronically fatigued or if you experience excessive tiredness, it may be a sign that your body is deficient in important vitamins and minerals. We need an appropriate balance of all vitamins and minerals for good health and energy-maintenance. However, certain nutrient deficiencies are associated with reduced energy levels. In people with deficiencies, B vitamins (including B6, B12, folic acid, thiamine and niacin) have been shown to support the energy metabolism process. This group of vitamins affects how our body’s process and convert the nutrients we consume into energy. WHO NEEDS B VITAMINS FOR ENERGY? Some people are more likely to be deficient in B vitamins than others. Athletes who train hard are at particular risk, as are individuals with poor or limited diets. Certain medications, when taken regularly, also affect how B vitamins are metabolized and may contribute to B vitamin deficiencies. These medications include: acid blockers, anti-inflammatory painkillers and antibiotics. If you aren’t able to get enough B vitamins from your diet alone, or if you fit into any of the categories described above, consult with your doctor about a B vitamin supplement or a multivitamin containing 100% of most B vitamins. What Other Nutrients May Support Energy? Iron may be another important nutrient for energy support. Iron helps to oxygenate every cell in your body. Without enough oxygen, all of your systems can become fatigued. Exhaustion caused by iron deficiency anemia can affect everything from your immune system to your brain function. While adding iron probably won’t do much good if you’re not deficient, those at risk for iron deficiency anemia may benefit from taking in iron on a daily basis. See a doctor if you think you may be deficient in iron. Choosing a multivitamin with essential B vitamins and iron is one of the easiest ways to ensure you’re getting the daily energy support you need. 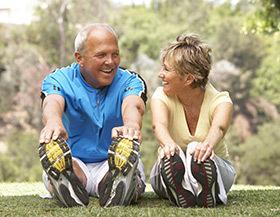 Geritol® multivitamin contains 100% Daily Value (DV) of most B vitamins, plus 90% DV for iron. If you have difficulty swallowing pills, or if you are already taking certain nutrient supplements, you can still get essential B vitamins and iron without a full-blown multivitamin. 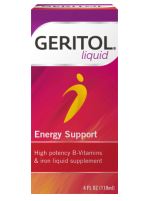 Geritol® liquid contains key B vitamins and iron at high potency levels for energy support. Always consult with your doctor when adding any dietary supplement to your regimen and be very careful about combining supplements. Getting too much of certain vitamins and minerals (including fat-soluble vitamins and iron) can be dangerous. Choosing a well-balanced multivitamin like Geritol® is the easiest way to make sure you’re getting the nutrients you need, in just the right amounts for energy support. See your doctor if you think you may be deficient in iron, as iron deficiency may indicate an underlying problem. Energy Boosters: Can Supplements and Vitamins Help? Vitamins and Supplements Lifestyle Guide. 2005-2013 WebMD. Retrieved from: http://www.webmd.com/vitamins-and-supplements/lifestyle-guide-11/energy-boosters-can-supplements-and-vitamins-help?page=1 January 16, 2013. Vitamins. November 07, 2012. U.S. National Library of Medicine. Retrieved from: http://www.nlm.nih.gov/medlineplus/bvitamins.html January 2, 2013.